Villa Kipari Dyo is located in the beautiful grounds of the Kipos development. The property was previously a studio and an apartment but has been renovated to the highest standard to create one villa. 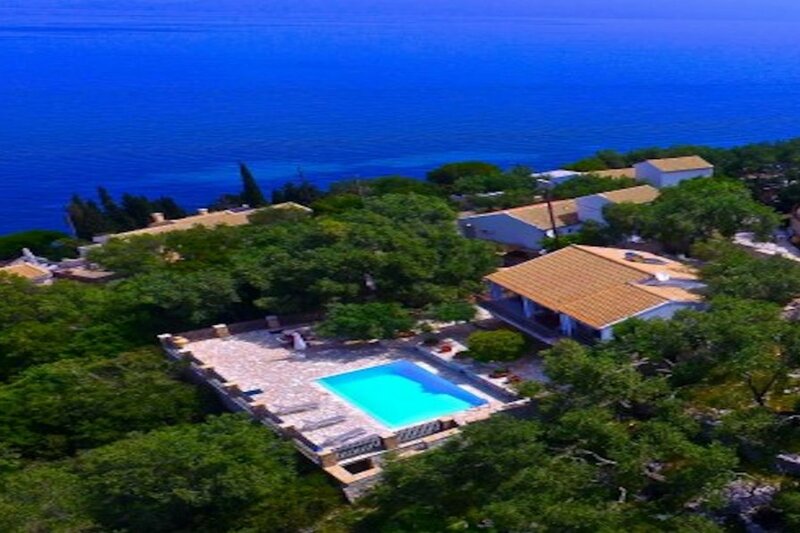 Its elevated position offers spectacular views over olive clad hillsides to the cliffs of South Corfu and the mountains on the Greek mainland. The villa's interior is furnished with elegant simplicity and decorated in light calming tones. The property is spread over two levels offering spacious and comfortable accommodation. The upper level, the main area, has two bedrooms, one double and one twin and a well-appointed bathroom. In addition it has a large open plan living area with a sitting room, dining facilities and a fully fitted kitchen. The large windows and patio doors give a bright and airy feel and lead to a large veranda running the width of the property offering stunning views and perfect for al fresco dining. On the lower level there is the second bathroom and a useful poolside kitchen. The extensive outside terrace is constructed solely of local Paxiot stone. The patio has a colourful variety of potted shrubs and plants and is surrounded by olive trees offering shade from the midday sun. This leads to a private swimming pool with sun loungers.